"Thomson church, formerly the Island Mission, is located on Zane's (Wheeling) Island, in the seventh ward, and was originally organized for a mission Sunday-school. In 1855, Daniel Zane tendered the lot, and helping in building a frame house 36 by 48 feet. This was replaced, in 1872, by a handsome brick edifice, named after Bishop Thomson, who had died in Wheeling a short time previous." The cornerstone of a new church structure, designed by Fulton and Butler Architects of Uniontown, Pennsylvania, was laid in September of 1913 with the new building dedicated by a week of services beginning May 9th and ending May 16th, 1915. The 1915 church has been the home of the New Life United Methodist Church since 2008. ▶ Vertical File: Wheeling Methodist Churches (Wheeling Room, non-circulating, ask for access at the reference desk). 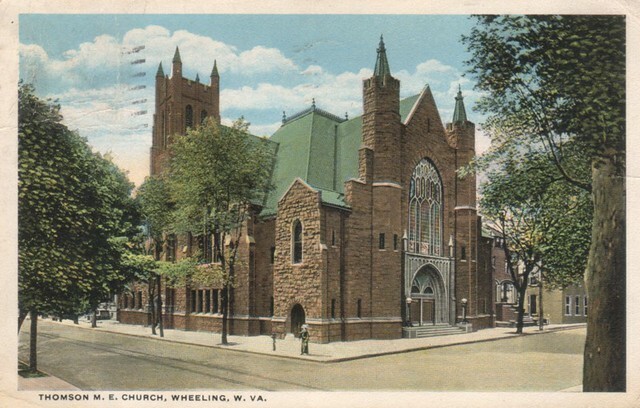 ▶ Church records, Wheeling, West Virginia, 1818-1954, (Wheeling Room, non-circulating, ask for access at the reference desk. Call#: Wheeling 929.3754 C473).